Double Denial of Newspaper Sensation. 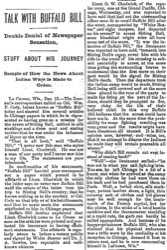 STUFF ABOUT HIS JOURNEY Sample of How the News About Indian Wars Is Made to Order. LA CROSSE, Wis., Dec. 13.—The Journal's correspondent called on Col. Wm. F. Cody, better known as "Buffalo Bill" today and showed him several articles in Chicago papers in which he is represented as having gone on a mission for the arrest of Sitting Bull, attired in silk stockings and a dress coat and stating further that he was under the influence of liquor at the time. "That is all bosh," said "Buffalo Bill;" "I never saw this man who styles himself Lieut. Chadwick. He was not a man of our party and I never saw him in my life. The statements are pure falsehoods." In confirmation of his statements, "Buffalo Bill" handed your correspondent a paper which proved to be affidavit of Lieut. 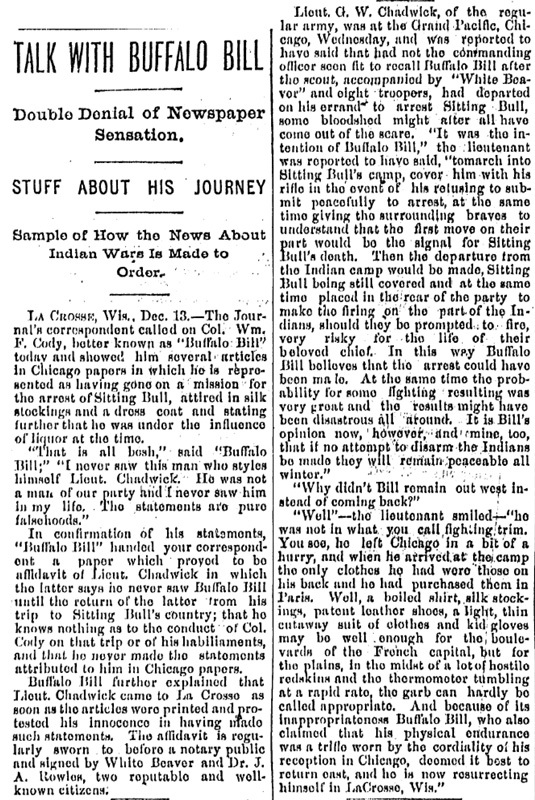 Chadwick in which the latter says he never saw Buffalo Bill until the return of the latter from his trip to Sitting Bull's country; that he knows nothing as to the conduct of Col. Cody on that trip or of his habilaiments, and that he never made the statements attributed to him in Chicago papers. Buffalo Bill further explained that Lieut. Chadwick came to La Crosse as soon as the articles were printed and protested his innocence in having made such statements. The affidavit is regularly sworn to before a notary public and signed by White Beaver and Dr. J. A. Rowles, two reputable and well-known citizens. Lieut. G. W. Chadwick, of the regular army, was at the Grand Pacific, Chicago, Wednesday, and was reported to have said that had not the commanding officer seen fit to recall Buffalo Bill after the scout, accompanied by "White Beaver" and eight troopers, had departed on his errand to arrest Sitting Bull, some bloodshed might after all have come out of the scare. "It was the intention of Buffalo Bill," the lieutenant was reported to have said, "to march into Sitting Bull's camp, cover him with his rifle in the event of his refusing to submit peacefully to arrest, at the same time giving the surrounding braves to understand that the first move on their part would be the signal for Sitting Bull's death. Then the departure from the Indian camp would be made, Sitting Bull being still covered and at the same time placed in the rear of the party to make the firing on the part of the Indians, should they be prompted to fire, very risky for the life of their beloved chief. In this way Buffalo Bill believes that the arrest could have been made. At the same time the probability for some fighting resulting was very great and the results might have been disastrous all around. It is Bill's opinion now, however, and mine, too, that if no attempt to disarm the Indians be made they will remain peaceable all winter." "Why didn't Bill remain out west instead of coming back?" "Well"—the lieutenant smiled—"he was not in what you call fighting trim. You see, he left Chicago in a bit of a hurry, and when he arrived at the camp the only clothes he had were those on his back and he had purchased them in Paris. Well, a boiled shirt, silk stockings, patent leather shoes, a light, thin cutaway suit of clothes and kid gloves may be well enough for the boulevards of the French capital, but for the plains, in the midst of a lot of hostile redskins and the thermometer tumbling at a rapid rate, the garb can hardly be called appropriate. And because of its inappropriateness Buffalo Bill, who also claimed that his physical endurance was a trifle worn by the cordiality of his reception in Chicago, deemed it best to return east, and he is now resurrecting himself in La Crosse, Wis."